In the ancient Hills of Samaria, in the shadow of the ancient Tabernacle, terrorism is just a blip in a chain of Jewish destiny. With the recent "wave of terror" in Israel beginning, by all accounts, to wind down, much of the media's attention has already begun to shift away, onto the next story. But in areas worst-struck by Arab terrorism, residents and local businesses are only beginning the road to recovery. For Israelis this is a sadly familiar process, one they have become accustomed to after decades of intermittent "waves of terror," each one taking a slightly different form but always leaving grieving families, injured victims and much damage to local businesses and communities in their wake. Perhaps nowhere in the country have communities become more adept at picking themselves up and soldiering on again than Judea and Samaria, where even outside of "intifadas" and "terror waves" the threat of jihadist attack is often more immediate than in the major cities. For locals, this determination is second nature - but also a subtle form of passive resistance, as if to say that no amount of deadly terrorism can dislodge the Jewish people once more from its ancient homeland. Shiloh, where this author lives, is a case-in-point. Nestled in the ancient Hills of Ephraim, site of the first capital city of Israel - home to the Mishkan (Tabernacle) which preceded the Temple in Jerusalem by three centuries; and where the Prophet Samuel who crowned Israel's first kings first heard the Voice of God - modern-day Shiloh is a vibrant, growing community which has remained as such even with the dark clouds of jihad swirling in the valleys around it. Since moving here three years ago I have come to admire my neighbors for their quiet determination - even, in too many cases, after they or their families have been struck by deadly terrorism - and their stoic optimism and faith which can at times appear baffling to outsiders. So it was only natural that, as Passover approaches, the community has moved seamlessly from a state of high alert into a celebration of life and renewal, without batting an eyelid. Though coincidental, the re-inauguration of Shiloh's central synagogue this coming Friday couldn't have been more appropriately timed. The Shiloh Tabernacle Memorial Synagogue (Beit Knesset Zichron Mishkan Shiloh) is the jewel in the crown of the community. 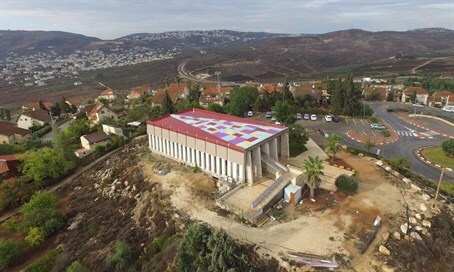 An ornate, beautifully-designed structure, built to replicate the Biblical Tabernacle which stood some 3,500-4,000 years ago, it is hard to miss as one approaches Shiloh, an impressive edifice perched proudly on one of the highest hills in the town. It was originally built a quarter of a century ago, as a symbol of the Jewish people's return to their ancient capital city, renewing Hebrew life in the shadow of the holy Mishkan. Reflecting that dual sense of history and destiny, architects modeled the structure on the Tabernacle itself, based on scriptural references, and incorporated its "vessels" into every aspect of the services. From the chazan's podium modeled after the Golden Altar, where the sounds of prayer waft through the air in place of the incense once offered by the Kohanim; to the Table of Showbread (the stage, or bima, from which the Torah is read); to the Aron Kodesh itself - and the most intricate and beautiful detail of all: the roof, decorated in tribute to the colorful skin of the legendary "tachash", a rare unidentified animal whose enormous hide adorned the Mishkan. The years and decades, however, had taken their toll somewhat, but after a prolonged process of renovation, the decision was made to mark the renewal of the beating heart of this community by celebrating its life blood: the people. "We chose to celebrate with a family-friendly fair - with fun activities for children, and showcasing local tradesmen and products like wine, jewelry, pottery and art - for two reasons," said Raphael Fischer, who heads the synagogue's board of directors. Communities in Judea and Samaria tend to revolve around the youth, so a family event was a natural choice. "Firstly, because now is a time of year when schools and daycares are on vacation, so parents will be looking for things to do with their children - which meant a pre-Passover fair seemed like a great idea," explained Fischer. "And secondly, but no less importantly, because what better way to celebrate the continued strength of this community than through the people who make it what it is, and of course the children? They are our future." "We never thought about canceling, even when the attacks were really bad," he added with a wry smile. "We've all been here before, and each time the Jews have overcome." Hundreds of people are expected to travel from local communities and beyond, but events like these, I have come to learn, are more than simple community events - they really are hidden gems usually missed by tourists and visitors to Israel who stick to the well-beaten tracks. The Samaria region, for example, is home to a staggeringly large number of international award-winning wineries, and is packed with local craftsmen, artisans and artists. Each of them has a remarkable story to tell, their children's laughter echoing off these ancient hills, and their deeply-felt connection to their land infused into its vineyard and their delicious, heady wines. The Biblical prophets talk of Jewish children once more playing in the shadow of the Temple in Jerusalem. Here in Shiloh, they play in the courtyard of the Tabernacle.